Stems: Erect, stout, solitary, branched above, minutely pubescent. Leaves: Alternate, on stalks 1.5 to 6 inches long, triangular in outline, 2-3 times pinnately compound; leaflets ovate to oblong, 2.5 to 7 inches long, 2.5 to 6 inches wide; margins toothed to entire; upper leaves reduced. 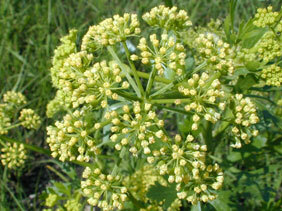 Inflorescences: Umbels, compound, loose, somewhat rounded, 2 to 5 inches wide, 6- to 12-rayed, terminal. Flowers: Many; calyx teeth ovate; tips pointed; corollas tiny, 5-parted, yellow to greenish yellow. Fruits: Elliptic to round, 1/4 to 1/2 inch long, flattened, corky-winged, glabrous, splitting into a pair of 1-seeded segments; seeds flat. Habitat: Dry, rocky soils of prairies and open woods.